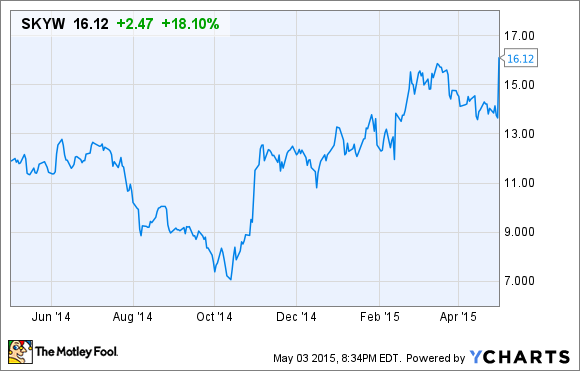 SkyWest Airlines, Inc. Soars 18%: Is Republic Airways Next? Both regional airline companies are embracing larger 76-seat regional jets to boost their profitability. On Friday, shares of SkyWest (NASDAQ:SKYW) surged 18% after the regional airline leader reported Q1 earnings that exceeded analysts' expectations. This caps a rapid comeback for SkyWest, which posted big losses in the first half of 2014, and for its stock, which bottomed out near $7 last October but has now surpassed $16. SkyWest 1 Year Price Chart, data by YCharts. While SkyWest struggled through much of 2014, its largest competitor, Republic Airways (NASDAQOTH:RJETQ), has posted much more consistent earnings lately. Yet its stock has fallen more than 15% since February. Could Republic's upcoming earnings announcement this Friday spark a similar rally? In Q1 2014, SkyWest posted an ugly loss of $22.9 million, or $0.44 per share. Severe winter weather forced the company to cancel about 27,000 flights during the quarter, reducing its revenue and causing it to incur unusual costs. More broadly, SkyWest has struggled with a few unprofitable flying contracts at its ExpressJet subsidiary, which have been a drag on its results for several years now. However, SkyWest bounced back in a big way in Q1 2015. While there was still plenty of severe weather, the company dramatically reduced its cancellation rate this year. This allowed SkyWest to post EPS of $0.18 last quarter, far better than the $0.03-per-share loss that analysts were expecting. SkyWest is also making progress on its fleet transition plans. It will retire the last of its 30-seat turboprops this week, and is also retiring dozens of 50-seat jets this year in favor of 76-seat two-class regional jets, which are more popular with the legacy carriers these days. As 76-seat jet operations become a larger proportion of the company total, SkyWest's profit margin should rise. Republic also had lots of flights canceled in Q1 2014, but thanks to its more favorable contracts, it still managed to turn a profit of $14 million, or $0.26 per share. For the full year, Republic posted adjusted EPS of $1.40, which was a very solid result. Republic has gone even further than SkyWest in terms of dumping 50-seat jets and replacing them with more profitable 76-seat jets. In fact, last year it presented a plan to move to a single fleet type of Embraer E-Jets by late 2016. If this plan succeeds, it will significantly reduce Republic's costs by reducing the frequency of pilot training events, improving pilot productivity, and driving maintenance efficiencies. In the short term, Republic's earnings trajectory is likely to be uneven. The fleet transition could actually impair its efficiency in the short run as pilots and other staff have to be retrained to switch from Republic's Bombardier turboprops and 50-seat Embraer jets to the 76-seat E-Jets. On top of that, Republic is facing a big rise in costly engine maintenance events this year compared to 2014. So it's hard to say whether Republic Airways shares will start moving higher in the near future. But with the company already making progress toward its goal of operating a single fleet type, Republic's earnings should head higher over the next two to three years. In the long run, this should drive solid share price appreciation for Republic Airways investors.